As Rick Scott's time in office is winding down, his administration is strategically ousting qualified, experienced state employees and replacing them with Scott staffers and loyalists who have little or no relevant experience, according to a new Miami Herald/Tampa Bay Times report. Some capable, experienced administrators were ousted for Scott cronies. With other posts, administrators were told to hold positions open and then to take resumes from Scott appointees—not looking for more qualified employees. Some of these cronies are making thousands more than their more experienced predecessors—with salaries of up to $117,000. They are working in the revenue department with no experience in tax policy. One post is required to be filled by a lawyer—but the Scott ally in the position doesn't have a law degree. Scott has a long history of pushing out qualified and experienced state employees in favor of his cronies, including in positions responsible for protecting Florida's environment. And just last year he placed his grossly unqualified former travel aide in charge of the Department Of Emergency Management, which has struggled to deliver hurricane relief to Florida communities. Florida Democratic Party spokesman Sebastian Kitchen: "Rick Scott is more worried about looking out for cronies than the people of Florida—putting political appointees in high-paying important positions where they have no experience. Taxpayers deserve qualified employees in positions that pay $117,000—not Scott allies who want a cushy landing spot when he is out of office. Floridians deserve better than his self-serving politics." "The Florida Department of Revenue has ousted top employees and kept positions vacant for months to make room for many of Gov. 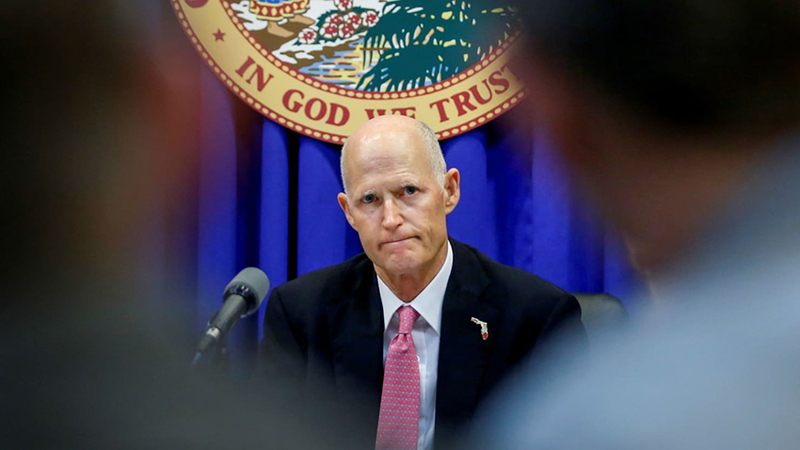 Rick Scott's loyal staffers who will be out of their jobs when he leaves office this year, even though none of them have any experience in that department's main responsibility, tax administration." "In the last month, Biegalski has replaced most of the top staff of the division with people close to him or the governor." "In 2017, as vacancies opened up through routine retirements and departures, the staff at the Office of Property Tax Oversight was told to keep many positions vacant, several sources close to the agency told the Herald/Times. They were given resumes from the governor's office and told to hire them." "The agency acknowledged that neither Gunder nor Adams nor Cecil were trained by their predecessors for the jobs, and none of the people Biegalski promoted filled out applications." "Last year, the Herald/Times reported that Taylor Teepell, a GOP political operative, was appointed by Scott to head a Department of Environmental Protection division despite having no experience. He was paid $110,000 and left large parts of his application blank." "Not everyone is as confident as Biegalski that replacing experienced professionals with newcomers with no property tax experience is a good thing for the state." "I think it's important to know a little about the job to be our oversight,'' she said. "Perhaps all you need to be is an administrator, but if I hired somebody for that job, I'd certainly hope they had some experience in a very complex area." "In addition to replacing DOR staff with those from the governor's office, Biegalski gave some of his new hires more money than those in comparable jobs in his agency." "Scott recommended he be chosen to head DOR over three more-experienced candidates despite Biegalski's lack of experience in tax or accounting administration."